Now that Spring is officially here in the northern hemisphere there are many signs of new life and new fruits and vegetables showing up at the farmers market. The spring greens are abundant, both wild and cultivated, and the warming weather will give birth to the summer feasts ahead. I hope wherever you are in the world you are enjoying the natural bounty and loving relationships with family and friends. This edition of Vibrant Life contains an article on wild edible plants, my Life Line Screening results and commentary, some wonderful new recipes all containing wild greens, another great testimony, and the usual quotes from those who know best. Enjoy! Someone submitted this testimony on the website last week titled “Healing digestive orders and feeling great.”, which is just another example of what is possible through the raw diet. Healing digestive orders and feeling great. For some the idea of eating wild edible plants is a pretty crazy idea, but these wild plants are a super store house of nutrition and life giving energy. Although the term wild edible plant covers many types of plants and many parts of the plants, what I am focusing on here is the edible wild greens, basically what we commonly call “weeds”. Sounds strange I know, but I promise you if you get into eating these free and abundant super foods you’ll never look at your back yard the same way again. The funny thing is that all fruits and vegetables were wild at some point until man hybridized certain ones into the common fruits and vegetables we are familiar with today. 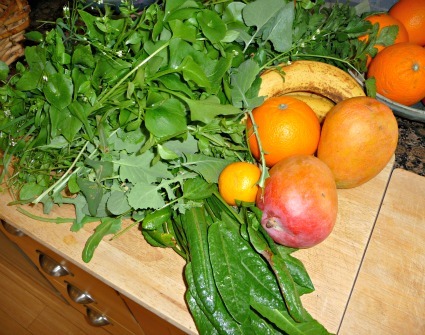 There are a number of reasons I choose to eat wild greens. •	They contain super nutrition Wild greens have not been modified by man, they grow naturally in the conditions that best suit their existence. Wild plants are hardy and can grow in diverse conditions. They don’t get watered everyday and sometimes they are subjected to very high or low temperatures. Stressing the plants in this way makes them stronger and full of vitality as they produce more of the phytochemicals that protect them from the savages of nature. Wild plants can send down fine roots 100’ or deeper in search of water, minerals, and other nutrients. When we eat these plants we reap the nutritional goodness that they have fought so hard to glean. •	They contain life force and vitality. As soon as a plant is picked it begins to lose its life force and the enzymes it contains, so imagine how much is left in the produce at your local market. Even if you shop at the farmers market your produce could be 24 to 48 hours or longer since harvest. The only way to get all the goodness and vitality a plant or fruit has to offer is to eat it as soon as you harvest. If you have fruit trees and or a garden you can enjoy the full vitality they have by harvesting just before eating. Sometimes I graze on wild greens while hiking or in the back yard as a nice balance to my fruit. Nothing feels better. •	They require no work on your part. Wild greens are just that, wild. In fact you have probably cussed at their appearance in your yard every spring for years. No planting, fertilizing, cultivation, or watering needed on your part. All you have to do is pick them and eat them. •	They could sustain you in an emergency. Suppose there was some kind of disaster and there was no food available anywhere, not even the farmer’s market. You could forage and survive on edible wild plants for as long as you needed to. I always have a stash of dates or other dried fruit, some nuts and seeds, seaweed, and super green powder in the event I am unable to get any food elsewhere for whatever reason. Those basics mixed with wild plants could make for a very nice existence until things returned to normal. Being able to “live off the land” could be a very useful skill to have. Even the green grass on the hillside could be juiced to provide some wonderful nutrition. •	A ready supply of greens to supplement your store bought greens. 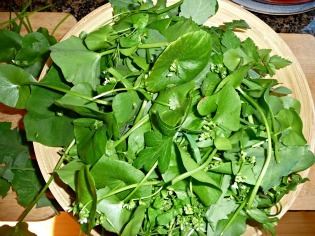 If you are making a recipe and need more greens, just hop out to the yard and pick what you need. Never be without fresh greens again. •	They are free. Now that one is pretty hard to beat; free food, count me in. How much do you spend on greens in a week? If you eat as many greens as I do and you don’t grow your own then you stand to save quite a bit, even if you only supplement with the wild greens. •	It’s a great way to get out of pulling weeds. Instead of doing those all weekend weed pulling extravaganzas you can justifiably pull the weeds as you eat them. Tell your spouse it’s food that shouldn’t go to waste and that you’ll eventually get the “weeds” back under control….lol. For me these are pretty compelling reasons to make use of the “weeds” in our environment. Some, like the minor’s lettuce that I have been eating since my pre-teen years in the boy scouts, are pretty easy to identify, but others are not so easy to identify the first time, which is why it’s important to know which plants are edible and which are not. I have five books on the subject that help me to identify what’s OK, and what’s not. 2) Edible and Medicinal Plants of the West, by Gregory L. Tilford This is a very good book with color photos and in depth descriptions, and as the title states, is better for those in the west. 3) Edible Wild Plants – Wild Foods from Dirt to Plate, by John Kallas This is a very good book and I think the easiest to use. It has large color photos and in depth descriptions about the plants and also useful information on wild plants in general. It does have cooking recipes for some of the plants. This one covers the entire USA and in doing so probably covers many places around the world. This is the book I find most useful, although I do use them all to some degree. 4) Edible and Useful Plants of California, by Charlotte Bringle Clarke This one has some small color photos and lots of black and white drawings. She shares the many uses of the plants like making housing and clothing, and recipes used by local indigenous people. This book is for those in California as the title states. 5) Free Food and Medicine- worldwide edible plant guide, by Markus Rothkranz This has lots of color photos and descriptions. It is packed with info and a little overwhelming with info on flowers and many common fruits and vegetables. I would have preferred leaving out the garden veggies and common fruit info which can be easily found elsewhere and focusing more on wild plants, but it does have good information on edible plants worldwide. If I was taking a trip out of country I would probably take it along. I say probably because it is quite heavy…lol. Thirty years ago when I was working in the Pacific Northwest, my fellow loggers and I would enjoy huge feasts of wild blueberries, blackberries, and raspberries in the high mountain meadows of the Cascade Mountains. In late summer the berries were abundant as was the bear poop, which demonstrated how much the bears were enjoying the feasting as well. The berries are a very obvious edible wild plant, but there are hundreds of edible plants all across the USA and the world. They’re in the mountains and foothills, in the valleys and deserts, in the hills behind your house and in your own back yard. 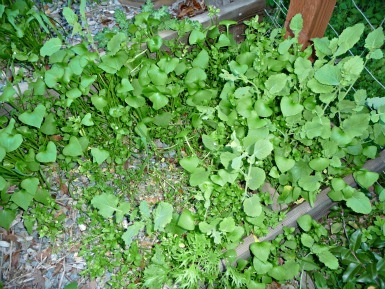 I have seen purslane, nettles, chick weed, mallow, and miner’s lettuce growing in the city under trees, in vacant lots, and out of the cracks in the sidewalk. I would be a little more careful in the city about where I harvested from, but the point is they’re everywhere in our environment. I have linked a few of my wild greens recipes further down in the newsletter so you can get an idea of how easily they can be incorporated into your diet. I hope I’ve made you at least a little curious about the health benefits of eating those weeds growing out there in your yard, and perhaps inspired you to whip up a tasty recipe of your own. And remember, you don’t have to spend all day pulling weeds in your yard if you harvest a few at a time from nature’s wild garden. In mid February I went for some tests offered by Life Line Screening that are designed to help people with early diagnosis of conditions like heart disease and diabetes. Now I didn’t think I was anywhere close to having any health issues typically related to the general population who follow and unhealthy lifestyle, but I thought it might be fun, and informative, to see what my markers looked like. Gretchen was going to go so I thought I would go along and get tested as well. You probably receive mailings from Life Line or a company like them offering these tests somewhere in your neighborhood. I have often wondered about them and the safety of these tests. Before participating I did a little research and found these to be pretty non-invasive tests. The total for my tests was about $333, which I felt was a good value for the test results provided. The whole process was fairly easy and took about an hour and a half from the time we walked in the door. Following are the screenings and the results. Carotid Artery Disease Measures Plaque buildup and blood flow. - Normal, no risk. Atrial Fibrillation Four limb EKG. – Normal, no atrial fibrillation. Heart rate 44 beats/min. Abdominal Aortic Aneurysm Abdominal aorta size. – Normal. Peripheral Arterial Disease Ankle brachial index. – Normal. Osteoporosis Bone mineral density (BMD) right ankle. – Low risk. Body Mass Index - Normal. C-Reactive Protein - Low risk. Blood Pressure - pre-hypertension, 136/69. I have issues with this test because that’s the highest BP reading I have ever had in my life. I take my BP every Sunday morning on the way home from the farmers market and it is always approximately 98/63. I thought something was wrong with the reading and wanted the technician to take it again, but they had a full house and he needed to keep moving. The next morning on my way home from the Farmers Market it was low as usual. My BP is always low and so this off reading is not a concern to me. Because of the BP reading and the low HDL score they put my Heart Risk Assessment at moderate and recommended I consult with a doctor. Gretchen and I had a laugh over my “pre-hypertension” designation, and of course I am my own doctor. I look, listen, and pay attention to my body making any adjustments as I feel need be. I found this group of tests useful if for nothing else than to reinforce that my current health regime is working for me. I have on occasion done a complete blood work-up analysis with my good friend Dr Rick Dina who makes his living helping people become healthier via a high raw diet. I know there are those in the raw community who don’t believe in testing or supplements, but I feel they both can be useful in attaining good health, which is what it’s really all about. Here’s an example of how an undetectable deficiency can lead to long term health issues. A person can have low B12 levels for many years before severe symptoms present themselves and one realizes there is an issue. Even after symptoms do show up it can take months to diagnosis the true cause of the symptoms unless you have the help of a knowledgeable natural health person. One of the markers for possible B12 deficiency is elevated homocysteine levels. Homocysteine is an amino acid which is made by your body from another amino acid called methionine. Normally, homocysteine is converted to S-adenosyl methionine (SAMe) and glutathione, both of which have huge health promoting qualities and functions. You’ve probably read about SAMe and glutathione and know they are well known for their anti-aging properties as well. Vitamin B-12 is required to make the conversion process possible and without it homocysteine levels in the blood will be elevated. So a person can go along for years setting themselves up for disease in the long term with negligible to no symptoms of deficiency. I could feel great today and yet be setting myself up for dementia ten or fifteen years down the road. The information above about B-12 and homocysteine is published in prominent health journals and documented by dozens of epidemiological studies. Interestingly, both vegetarians and meat eaters can develop high levels of homocysteine. Eating animal protein results in elevated levels from its metabolic breakdown, while lack of B-12 means even the much smaller amount of homocysteine that vegans make can’t be cleared from the body. Imagine the high levels of homocysteine in the person who eats a large amount of animal products and is B-12 deficient…Yikes! I’m not trying to promote the use of supplements or testing protocols, I’m merely trying to share my ideas on the subject so you have more information with which to make an informed decision for yourself. Do your due diligence and decide what’s best for you. The recipes below all contain wild greens from my back yard.